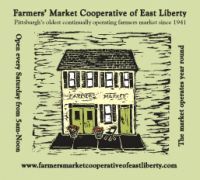 The Farmers' Market Cooperative of East Liberty is a permanent, indoor farmers' market. We are open every Saturday, year-round, from 5 am to 12 noon. We are located in the East Liberty neighborhood of Pittsburgh, Pennsylvania, making us the only year-round market operation in our city. We are one of the only sources of locally grown meat and fresh produce during Pittsburgh's winter months. We are the oldest continuously operating market in western Pennsylvania. We are 76 years old - the first day of operation was July 5th, 1941! What Makes the Market a "Cooperative?" The market also includes a number of other vendors that help bring a diversity of products to the market each week. Please visit Our Vendors page to learn more about each of them! 4/18/19	We have all your special holiday local foods at our Saturday Market! 4/12/19	Our local foods Saturday market has everything you need for Spring/Holiday meals! 4/4/19	"There is plenty of Spring variety of local foods at our Saturday Market!" 3/28/19	"Think Spring" with local food varieties at our Saturday Market! 3/21/19	"Welcome Spring with a variety of our Saturday Market local foods!" 3/14/19	Welcome Spring with local foods this "Green Holiday Weekend!" 3/7/19	Enjoy a wide variety of local foods at our Saturday Farmers Market! 2/28/19	Lots of fresh, local foods to warm you at our Farmers Market! 2/21/19	Let's add "Local and Healthy" to your winter menu! "Make The Market part of your Saturday routine." Open every Saturday, all year, 5am-noon.